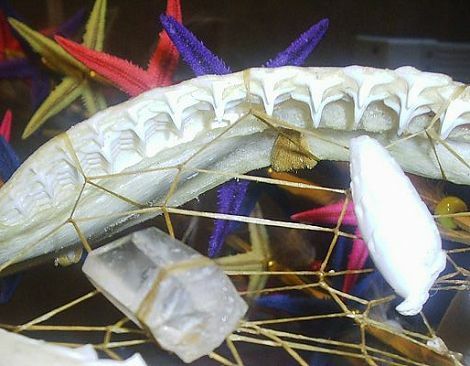 This unique one-of-a-kind dreamcatcher is made from a REAL SHARK JAW! 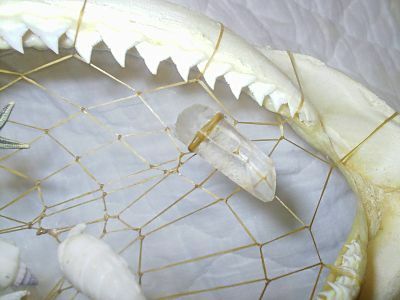 The web has a small starfish, six seashells (each one different) and a healing quartz crystal woven into the sinew web. The crystal is approximately 1/2 inch wide by 1 3/4 inches long. 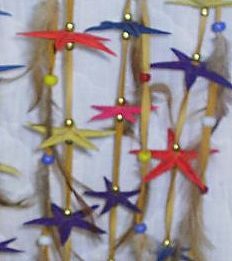 The long fringes and hanger strap are made from authentic deerskin and are decorated with red pheasant feathers, 80 brass beads, FORTY STARFISH in four colors (hot pink, purple, yellow, and dark blue), and 38 glass crow trade beads in red, yellow, white and blue. The starfishes vary in size from two to three inches. The shark jaw is approximately 12 1/2 inches across the widest part. 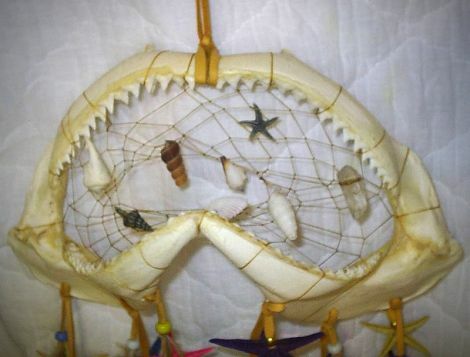 The dozens of razor sharp shark teeth made weaving this dreamcatcher a real challenge. The overall length, not counting the hanger loop is 32 inches. The hanger strap is an additional 8 inches, leaving plenty of room for adjustment. This colorful dreamcatcher will make a great addition to any nautical or native american themed room and is sure to be a great conversation peice. The larger pictures below may take a while to load if you are on dial-up, but I wanted to give you a view of all the intricate details of this unusual piece of art. Traditionally, a dream catcher was made for one at birth and kept throughout life, adding decorations as you wished. It was hung in a window or near the bed of a sleeping person. As they dreamed, the bad dreams got caught in the web, while the good dreams flowed down the feathers to the sleeping person. In the morning the sun entered through the hole in the center, to melt the bad dreams away. Originally, the dreamcatcher was an Ojibwe tradition, brought to them by Spider Woman. 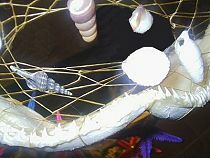 However, today, dreamcatchers are made by people of many nations. 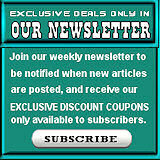 This product was added to our catalog on 03/05/2008.